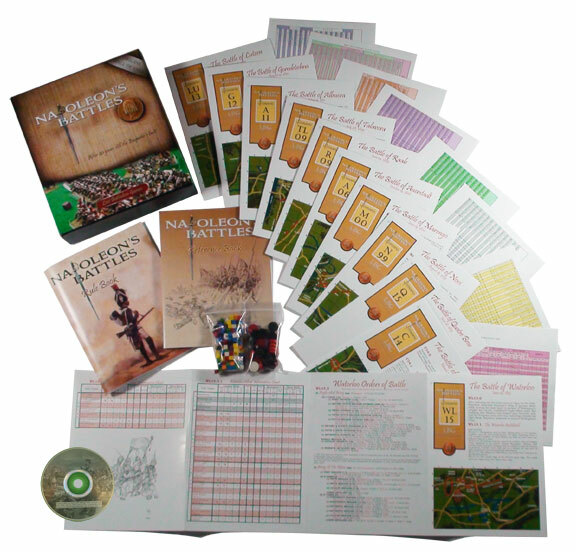 - Full color rules and reference books. - 15 player aid cards: 2 Game Cards, 2 Sequence of Play cards, 2 Artillery Fire Templates, 2 Spread Artillery Fire Templates, 2 Terrain Markers, 1 Artillery Spread Formation Spread Templates, 1 Brigade Skirmish Spread Template, 2 Manoeuver Template and a time record chart card. - Information cards for Austria, Bavaria and Saxony, Britain, Confederation, France, Iberian states, Italian states, Low Countries, Poalnd and Wurttemberg, Ottoman Empire, Prussia, Russia, Scandinavian states, Westphalian states. - 160 8mm cubed wooden Markers: Half Move, No Move, React, Rout, Disorder, Free Rolls, Limbered and No Supplies. 26 wooden discs for Mystery Deployment, Initiative and Turn Record and two ten-Sided dice. - One CD containing a database for generals and pdf files for the Scenarios and labels. Besides the new formating of the material (including a very welcome increasing of the font size!) making it more easily to manage, the inclusion of the CD and wooden markers, and some minor artistic licenses (the infantry bases show now 9 10mm figures in 3 files of 3 ranks), NB-III IS ESSENTIALLY THE SAME THING THAN NB-II. Therefore it will be somewhat disappointing for those gamers expecting new and radical variations, and a must for old freaks of NB like me! My copy is numbered #22, and it is signed by Coggins and Craig (the designers of the original NB). The LBG site is now containing some new material written by Coggins himself. See his last document about the Design of Napoleon's Battles.